The day President John Fitzgerald Kennedy was assassinated - November 22, 1963 - is one more day with others like the Invasion at Pearl Harbor and recently the September 11 Terrorist Attacks that asks where were you? And now being 60, that question takes me back in my memory to that moment which now is like not a fuzzy, but a brief cloudy-like moment when I was home from school that day with a cold. I remember being in bed and suddenly hear across the radio, the old style big wooden cabinet radio, the voice of the announcer breaking in with the news that the President has been shot. In that same moment my mother came into the bedroom saying (my name) "Jerry, the President has been shot". And I looked down and said "I know". Even being that young, I could feel in deep subsconcious something very dark had just happened. It felt like our father had just died, being killed. I was 10 years old and can vaguely remember some of the funeral procession across the Nation's Capital on the television everyone was watching - that haunting military drum march. Just after midnight in California June 5, 1968 on an anniversary of D-Day, the wee hours of the morning on the East Coast, it is reported Presidential Candidate Sen. Robert Fitzgerald Kennedy has been shot by an assassin and is in severe critical condition. The agonizing hours and final word he has died. I was now 14 years old. And yet another day gets added in 1969, the year of Woodstock and the Moon Landing, news spreads that Sen. Edward Kennedy has been in an automobile accident near Martha's Vineyard and the passenger who was a campaign aid has died from drowning, the car driving off a bridge at the tidal channel on Chappaquiddick Island. I was now 16 without hope of ever seeing another Kennedy in the Presidency. Ted had been charged with and pleaded guilty to leaving the scene of an accident with suspended sentence. My brother being several years older than me, was already sharing the couple books out as the Manchester book - "The Death of a President" and the another, "Six Seconds in Dallas", others. In High School, the reciting of the famous poem by Walt Whitman "O Captain, My Captain" stays in my heart like a great knife to this day. 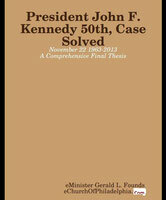 And so the story begins..... a very unique thesis in several aspects unheard - resolving how and by whom the execution of President Kennedy has taken place, and perhaps not a "National Cover Up" many of us suspected. All thanks be to God as they say, as this eBook is based on my Bible Study titled "JFK Assassination Solved By God". Amen. I am sure you will find ahead as best counsel from a Minister the closure needed via the truth and unspoken truth all these years. Even if not of faith - you may be surprised what has been written and references intentional and inescapable by the very head of the conspiracy who put the price on the head of President Kennedy and manner to be carried out. For more on the author see the chapter 'About the Author'. Thank you for your participation in this exciting read dedicated to the 50th Anniversary November 22, 2013 and to the Vidocq Society (Cold Cases Philadelphia), and like Beatle John Lennon said at the ending number on the rooftop concert in England, "I'd like to say thank you on behalf of the group and myself and I hope we passed the audition". Let us never forget Camelot!